This guide explains how to set access and viewing permissions for ReView recordings using the Share feature in ReView. Navigate and look for the video that you would like to change the viewing permission. Mouse over the video thumbnail for options. Specific people : this option allows you to share the video with specific people within the organisation as publishers, creators, or viewers. 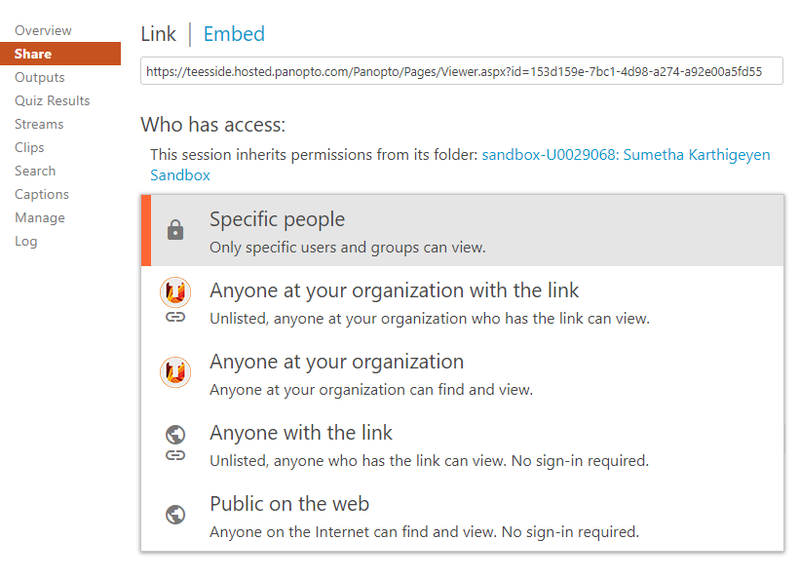 Anyone at your organization with link : Choosing this option will enable viewing access for anyone within the organisation (TU login) with the direct link. The session cannot be discovered by other users. Anyone at organization : This option will enable viewing access for anyone within the organisation who can log into ReView. Anyone with link : Choosing this option will enable viewing access for anyone on the Internet (i.e. externals), no sign-in is required. The session can only only be accessed using the direct link and will not be listed/searchable. Public on the web : This option will allow anyone on the Internet to find and access. No sign-in required. To share with specific individuals, select Specific people from the drop-down menu. Enter the name under the Invite people text field and select the individual. If the name does not appear in the drop down list, the (Panopto) system has not registered the individual as a user. Request the user the to sign-in to the ReView website (https://teesside.hosted.panopto.com). By default the Notify people via email option will be ticked. You can also include a personal message. Click Send and save changes. If you do not wish to notify people, then untick the checkbox and click Save changes. In order for the user to access the video you will need notify or provide the link (found at the top of the page). You share the link to a video using the link. Copy and paste the link in format or space that you would like your users to access it. (i.e. email / website). Ensure the video has the right viewing permissions (see above). You can also chose to embed the video. This will playback the video within your website.